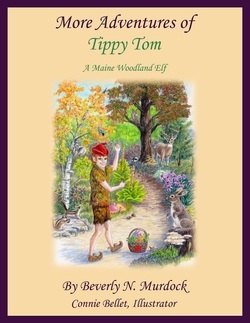 Tippy Tom is a Maine woodland elf. He is only 12" tall, has very bright green eyes full of merriment. He wears a pointed red hat with a bell on the end, shoes that turn up on the toes and a little suit made from dry leaves. He is the healer for animals and birds. He carries a little basket full of his healing herbs. He calls it his "remedies bag" instead of medicine bag. He is seen only if you have been kind and good and if you have a very good imagination. Here are the tales of his many adventures with his forest friends and his human friends.